In the channel industry, deal registration has developed into a perennial “best practice” in successful B2B relationships. And yet, many vendors and manufacturers that deploy such imperative opportunities lack the fundamental basics to establish a lucrative advantage for their business partners. Is it due to: inexperience, misinformation, laziness, negligence, etc.? Whatever the case may be, vendors and manufacturer continue to deploy deal registration in their marketing strategy—and continue to never fully reap the benefits of their program possibilities. 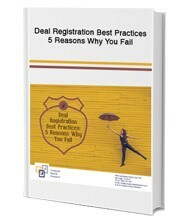 Take a look through this informative and fun eBook for “Deal Registration Best Practices” by filling out the form.